What we need now are some other not quite religious displays downtown. Ideas, anyone? How about dressing a hot dog up as Baby Jesus, but don’t tell anyone who it’s supposed to be…kinda like livin with the Taliban, except they don’t have hot dogs. YES. Bright, I agree. When I saw this, I was fully expecting to see a plastic, glowing hot dog in the center. Hot dog Jesus, huhmmm? I’m not sure anyone would relish the idea, depending upon what the hot dog is made of. My bad. The Palestinians evidently have not been waiting for hotdogs. See the new photo above. I was just getting online to ping you on this… It was pretty interesting seeing that as the big bus went by this morning. An emailer just pointed out that the arrival of a Casper-like being does not rule out the possibility of food and drink. Who woulda thunk that it would be Palestinians taking advantage of the City’s sidewalk dining ordinance? As of this morning, Casper was gone. I am unsure of the religious significance of this change. Casper gone? the possibly ‘Holy Ghost’ abducted? I don’t know what the religious implication might be , Kathy… but I bet Brendon Etter could come up with one, or two, … or even three! Clearly, the holy ghost has ascended into heaven, and is now seated at the left hand of his father. Griff: Did you catch the ascension Patrick mentions in your 300+ shots of Winter Walk? Can one of your fabulous cameras ZOOM all the way to “heaven’? It’s been a long while since I attended Catholic school (as in, decades), but I’m pretty sure it’s a little early in the liturgical year for any ascensions…. We have to wait for the end of Advent for the Babe to appear. Oh, have faith, all ye coffee addicts. To quote one of my favorite films, if “the Dude abides” so can the Babe. 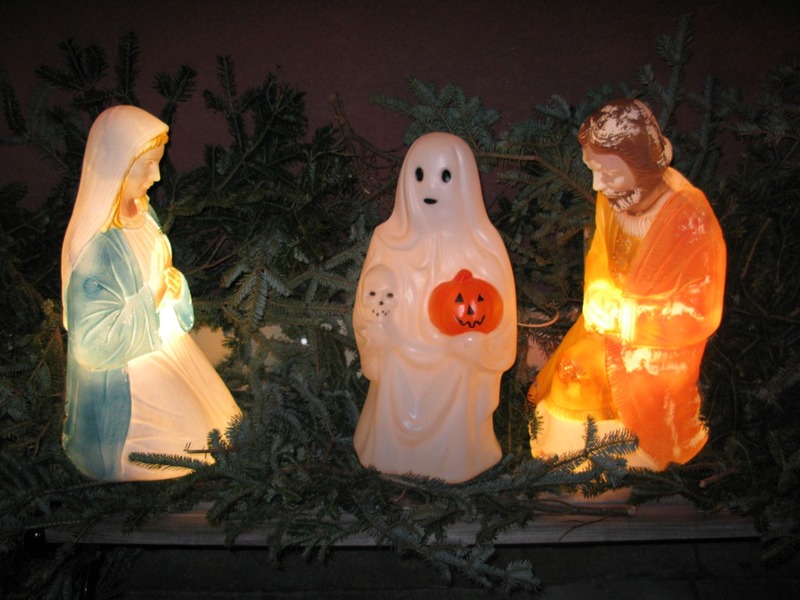 The Ghost of Halloween Past was only a messenger, sort of like John the Baptist if I remember my Lutheran Sunday School. So Andrea, you said we’d have to wait till the end of Advent for the King/Babe to appear. What do you make of this latest development? I am sorry to have to report that that wasn’t the Holy Ghost, It was just a late Halloweiner who just got back from the Coast. I blogged this last year but it’s worth repeating here, given the significance of this, um, appearance. Most bibliophiles know A.J. Jacobs by his best-seller, The Year of Living Biblically: One Man’s Humble Quest to Follow the Bible as Literally as Possible. Lesser known is his 1994 book, The Two Kings: Jesus & Elvis, (which I first read about in an Utne Reader ‘back page’ in the mid-90s) in which he deftly notes the eerie parallels between the two superstars. Jesus said, "Love thy neighbor" (Matthew 22:39). Elvis said, "Don’t Be Cruel" (RCA, 1956). Jesus said, "Man shall not live by bread alone" (Matthew 4:4). "Then they took up stones to cast at [Jesus]" (John 8:59). Elvis majored in woodshop/industrial arts in high school. Jesus wore the crown of thorns. Jesus said, "If any man thirst, let him come unto me, and drink" (John 7:37). Elvis said, "Drinks on me!" (Jailhouse Rock, MGM, 1957). Elvis had irregular eating habits (e.g., five banana splits for breakfast). Jesus is a Capricorn (Dec. 25). Elvis is a Capricorn (Jan. 8). Jesus biography by Matthew (Gospel according to Matthew). "[Jesus’] countenance was like lightning, and his raiment white as snow" (Matthew 28:3). Elvis was part Jewish (from his maternal great-grandmother, Martha Tackett Mansell). There is much confusion about Jesus’ middle name – what does the "H" stand for? There is much confusion about Elvis’ middle name – was it Aron or Aaron? Jesus made rocks roll away from his tomb. Elvis was a rock and roll singer. for the gate is wide and the way is broad that leads to destruction, and there are many who enter through it. I suppose a person can meander around quite a bit on a wide, broad path. 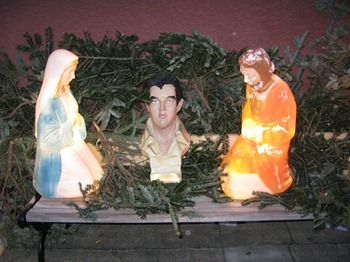 Elvis has left the building manger, replaced by a downtown savior. Just having coffee with a nice couple from out-of-town, Joe and Mary, trying to find out what brought them to Northfield and offer some downtown shopping suggestions. Apparently, then, the Palestinians WERE waiting for hot dogs, as you originally thought? I’m not only a minister, Kathie. I’m a prophet. Alas, I must confess (heh): I stole that original bit about Palestinians from Andrea Een. 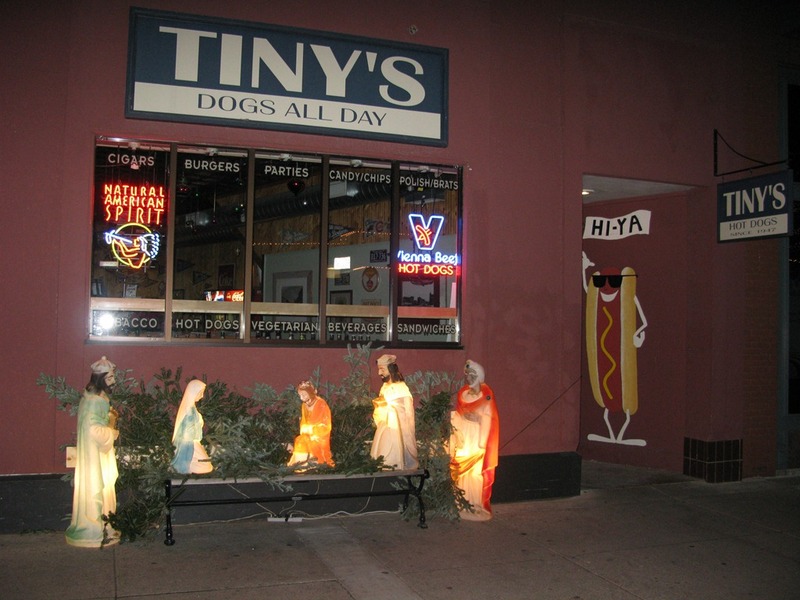 I guess if the Obamas can have a creche in the East Room of the White House, Tim should be able to display the baby Jesus on the sidewalk in front of Tiny’s. The White House is, as some recent interlopers have again proved, public property. And its East Room is one of the parts of it that are not reserved for the First Family’s private life. So the Constitutional question – should taxpayer-funded space be used for the affirmation of any faith? – is as real there, if not indeed more so, as it is anywhere else. I never cease to be amazed by how little the Bible-believing Protestants, who constitute most of the soldiery in the Christmas wars, know about their own tradition. Under the rule of the Puritan Revolution in the England of Oliver Cromwell (ancestor in many ways of the Pilgrim Fathers) the celebration of Christmas was banned outright. This was for three reasons: the December fiesta was actually the honoring of Paganism in disguise, and a descendant of the old rites of the Winter Solstice. Then, it was also a manifestation of Popery and superstition (the “Christ-Mass”). Finally, it was an excuse for the riff-raff to get drunk and over-indulge in general. Only the last part seems to have truly survived into our present day. It isn’t especially hard to see why. None of the four gospels gives any notion of what time of year (let alone in what year) the supposed Nativity occurred. 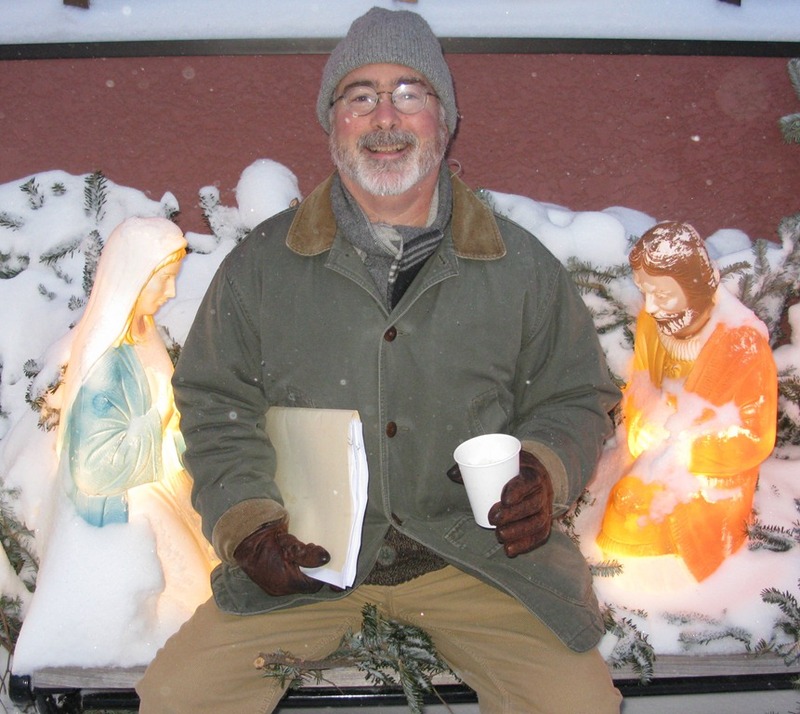 Only two gospels mention the virginity of Mary and only one has any mention of a “manger”. Nowhere is there any record of a “stable”. Wise men and shepherds are likewise very unevenly distributed throughout the discrepant accounts. So that the placement of a creche surrounded by a motley crew of humans and animals has no more Scriptural warrant than does “The Life of Brian.” Moreover, the erection of this exhibit near the turn of the year is actually a placation of the old Norse gods of the winter solstice – or “Yule” as the pre-Christians sometimes called it. When it comes to businesses which use city right-of-way to display merchandise, flowers pots and the like, everyone should be treated fairly. Shops which serve guests on city sidewalks must be properly permitted, while those whose display racks come out during business hours and go back in at night or set up an illuminated Nativity scene complete with Elvis as the baby Jesus, don’t have to. City Administrator Joel Walinski said enforcement is complaint based; that the city doesn’t have enough staff to scour the town for offenders, instead relying on residents to bring them to its attention. My question: How lenient should the city be? And if it doesn’t have the manpower to enforce the ordinance uniformly, how fair is that?